According to Flipkart, the Zenfone Max Pro M2 will be equipped with Corning Gorilla Glass 6. This device processor will be fast and its battery life will be more than 2 days. Sony’s sensor has been used for low-light photography and Bokeh effects. Earlier the leaked report revealed that, The Zenfone Max Pro M2 comes with 6 inch smartphone with 1080×2340 pixels resolution and Corning Gorilla Glass 6. This smartphone is powered by 1.8GHz octo-core Qualcomm snapdragon 660 processor which comes with 4GB high speed RAM and 64GB/128GB internal storage memory. You can easily expanded storage memory up to 512GB via microSD card. This smartphone runs on Android 8.1 oreo operating system with 5000mAh non removable battery. If we talk about the camera, this smartphone comes with 12 MP+5 MP dual sensor rear camera and 8MP front shooter camera for taking selfies with 2x optical zoom. The Asus Zenfone Max Pro M2 dual sim smartphone comes with 3G, 4G with Wi-Fi, PS, Bluetooth, USB OTG feature. You can also get rear fingerprint sensor, compass, magnetometer, proximity, accelerometer, hall, ambient light sensor and gyroscope feature. This smartphone supports Volte/4G/3G/2G on compatible networks. Processor Octa-core Snapdragon 660 processor, 1.8GHz. Adreno 512 graphics. Memory 4GB RAM with 64GB/128GB internal storage. Expandable up to 512GB via microSD. Display 6 inches IPS LCD display. 2340 x 1080 resolution with Corning Gorilla Glass 6, 420 PPI. 19.5:9 ratio. I hope you like Asus Zenfone Max Pro M2. At the moment, you should consider it as a potential specification. What you actually get in this device will be known only after the launch on December 11. 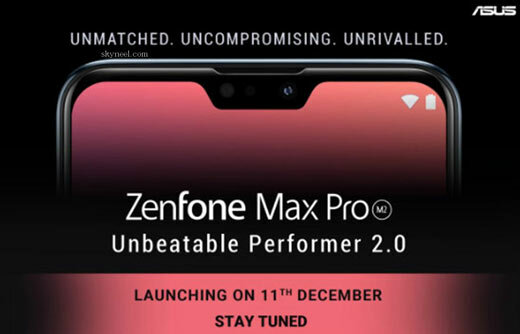 Please use comment box and share your view on Asus Zenfone Max Pro M2. Thanks to all.